Recommendations: The Subtle Art of Not Giving a F***-I like this book because it teaches you to stay focused on the things in life that matter and avoid distractions like TV, social media, technology, and things that don’t matter. Its helped me control my emotions and spend my energy on things that are actually important to me. I’ve never heard such emotion from a singer with lyrics as deep and as sad as these are. Seeing it live made me love the song even more. 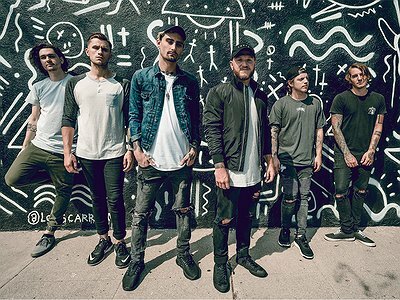 Website / Contact: If you enjoyed this interview with We Came as Romans, there is plenty more information on their facebook profile. My mom plays drums and my dad plays guitar so I’ve always been incredibly drawn to music. At a young age, they also bought me a keyboard! So I had three different instruments to play around on so it became an obsession at an early age. Once I was old enough and in the fifth grade, my parents bought me an electric guitar and I was hooked! All I wanted to do was play music and be in a band. My dad collects a lot of records and I loved pretending to rock out to his classic rock like Led Zepplin, The Beatles, Rolling Stones, etc. We had this massive old sound system in their basement and I loved turning it up as loud as it would go and listen to the music all day. For most artists, originality is first preceded by a phase of learning and, often, emulating others. What was this like for you? What is the the relationship between copying, learning and your own creativity? I became a singer because of bands like Blink 182, Relient K, Green Day, MXPX, a lot of pop-punk. And I started a pop-punk band but I was a really terrible singer. My mom bought me lessons to try and get better and also to sing properly so I’d stop losing my voice. As I got older, I started getting into heavier music. Underoath became one of my favourite bands and Spencer was one of my favourite vocalists. I learned to scream by mimicking him! Eventually, once I learned, I feel like I developed my own style and signature, which every artist needs to eventually do. If you sound like every other vocalist or every other band, you will never stand out or make a name for yourself as an artist or band. When we first started this band, we were all 15 to 17 years old and barely knew how to play our instruments, let alone write a song. Once we started getting the hang of making songs, we needed to find a way to stand out from the other bands in the area. We started playing to a click track so we could do live samples and more electronics. At the time, it was very new for a band of our genre to do something like that, so it helped us stand out. In a way, not much has changed. Whenever we write a new record, we are still thinking of ways to push ourselves and stay one step ahead of the trends in the music scene. The worst thing you can do as an artist is make the same record twice. Evolution is extremely important for an artist as well as trying to pave the way for new ideas in this style of music! The first time this band recorded was in a friend's basement in his parents' house. It wasn’t too bad considering our age, but listening back to it, everything was actually horribly done. Our set up has evolved and changed almost yearly. For example, we used to like to have a lot of big guitar amps on stage but as of today, we prefer a more “clean” look with less amps, more lighting, and different banners showing our artwork. So today, the Kemper guitar amps our guitarists use are very crucial! They’re also amazing to travel with because it makes their normally very complicated and large set up compact enough to fly with anywhere in the world. We also constructed a completely self contained front of house and in ear monitor set up so we no longer need to rely on any equipment from the venue besides the PA itself. Our in ear monitors are in a rack with a router which has an iPad that connects remotely to our front of house console, allowing us to mix our in ears from an iPad on stage! We aren’t gear nerds necessarily, but we try to make every piece of gear we travel with as efficient as possible! A new development on our new record is Kyle has a whole DJ set up on stage where he is using launchpads to trigger all the programming throughout our set. It makes the live show so much more exciting! Machines can’t mimic human emotion. When you add too much programming and things like “auto-tune” to the human voice, you’re cancelling out the human emotion! These are great tools to have in the studio, but you have to be careful to not alter the human voice too much, or you completely squash the emotion out of it! I described what we use on stage pretty well in a previous question ... but when it comes to writing and creating on the road, technology is so incredible. We can make an entire demo using only a laptop, a small interface, and a guitar! In the early days of this band, demo’ing was never that easy. Because of this, our songs are better because we are able to work on them a lot before we even get to the studio. We’re not a jam band, so we prefer to lock ourselves in a room with guitars and a computer and talk about what we want the song to sound like. We usually start with a riff we like and build off it. We’ll play with the chorus first with vocals and if we can’t make something fit, we’ll keep re-writing the chorus music until it does. Then we’ll build the rest of the song off that. We do some file sharing as well! But we prefer to sit in a room and play around on the computer and guitars. "When we first started this band, we were all 15 to 17 years old and barely knew how to play our instruments, let alone write a song."